If you've been thinking about pulling the trigger to start a blog you've been dreaming about, or finally turn your blog into a reliable source of income, now is the time to take that first step and get started. It's always easy to tell yourself you'll start on something next week. Or maybe you'll write it down on your list of things to do, but never get around to it. One of the hardest time management skills I used to struggle with was finding time for my blog. Prior to quitting my day job, working full time for someone else was my number one priority (let's face it, money pays the bills). When I started freelancing, focusing on my client's quickly became my second priority and eventually shifted to my first priority. It didn't matter what it was, my blog was always at the bottom of my list. After quitting my job, I thought I would have all the time in the world to focus on my blog. Um, can you say wrong?! I'm busier than ever hustling with my career. Finally I realized something had to change and realized it was time to schedule in my blog like it was a client. Now I schedule in this website like it's a client. It doesn't matter how my day looks, I schedule in at least an hour a day to accomplish something on my to-do list that is goal oriented. This has done wonders for my blog and really helps me stay productive. It took me months to pull the trigger and start this website. It was easier that I thought it would be and took no time to get started. Starting a blog has changed my life! In only ten months, I made over $13,000 from blogging! That's a lot of money to make in a short time, and it's all because I started this blog! Don't use Blogger or anything – you want to get your own domain name, use WordPress and have your own hosting. This way you have full control of your blog! It's really to self host if you use Bluehost – that's the company that hosts this website! We all know you should start with the Genesis theme as your Parent theme to get started (it's the most compatible theme with Google). The Genesis theme is like the bottom layer of your blog, or your “bones” of your blog. The top layer is your Child theme, which is what makes your blog look so custom! Picking a child theme really makes your personality shine through. When I first started blogging, I used a free theme mainly because it was free. But after a few months I realized I wasn't adequately expressing my blog's vision with the theme I was using. Why not cross this off your list? Having a theme you love making blogging more fun! Google Drive and Docs are the best and most secure places for creating documents. If you're feeling lonely and want to be part of a community, start commenting on your favorite blogs. Send an email to your favorite blogger and tell them how much you enjoy their blog. You could also do a Facebook search and look for groups that fit your niche. The Facebook communities are always really welcoming! If you need help with small (or big) tasks and have a limited budget (don't we all?) Fiverr is a great place to start. Every task is only $5 each! I've used Fiverr countless times for odds and ends on my website when I've either been short on time or don't know how to do something. If you've been putting something off because you don't know how to do it, there is an excellent chance someone on Fiverr can help you. It's time to cross that pesky item off your list so you can move forward onto something new! If you haven't tried Fiverr yet, here's a coupon for a $5 gig for free! Let's line up a chat so you can stop wasting time and come up with a plan of action! Speaking of Pinterest, Pinterest Presence will definitely help you create amazing images (for your blog AND Pinterest), learn how to navigate Pinterest effectively to get traffic and how to schedule pins. If you are having trouble committing to a regular blogging schedule or write your post and click publish, why not try to work ahead? While some posts are perfect to publish in the moment, why not try to create an editorial calendar with your posts ahead of time. If you're one of those people that has trouble writing and scheduling posts ahead of time, work on getting more organized! Take fifteen or thirty minutes and have a brainstorming session about topics you'd like to write about. Once you're done, add them to your calendar. You might have written enough post titles to schedule out a week in advance or even a couple months in advance. There's nothing worse than not posting regularly because you don't have anything lined up or can't think of something to write about. Along with creating posts ahead of time, why not search and download stock images ahead of time? Think of this as batch work – you are finding photos in batches to save for a later date. I have a library database I created that categorizes my stock photos into 2 sections – used and unused. Every time I use a stock photo in a post (and don't plan on using it again), I transfer it to my used folder where I keep all my blog photos. Find your golden time when you seem to be the most creative and devote a small portion of this time to bettering your blog. I try to have brainstorm sessions two to three times a week. This is generally when I'm either exercising or walking the dogs, or late at night with a journal. I really like thinking about my website when I'm away from my laptop and all electronics. This helps me clear my mind, be distraction free and just start writing. 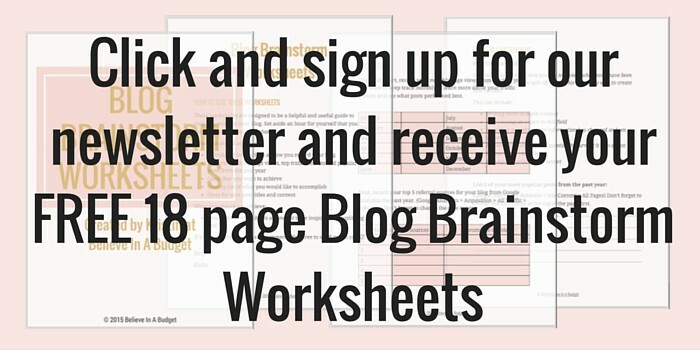 To help you get motivated, I created these blog brainstorm worksheets for you to download. 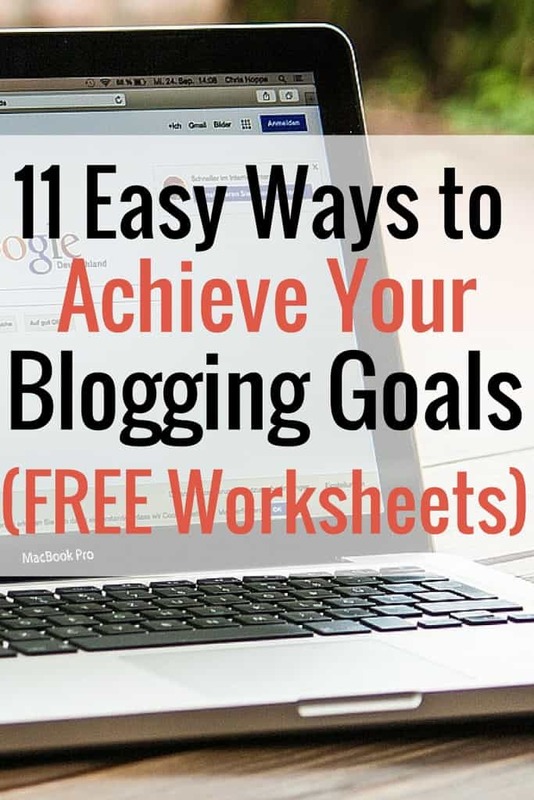 You can print out the .pdf as many times as you want, especially since you will need to revisit your goals every few months. What area of your blog are you trying to improve or wish you spent more time on? Hi Kristin…..My niece and I are thinking of starting a lifestyle blog from the perspective of a young mom and a mom of a young adult. We both have hidden diseases (think, depression, bi-polar disorder, etc.) Can you recommend some good lifestyle blogs for us to review? Thanks for the worksheets. Hi!! Thanks for checking out my blog 🙂 Hmmmm, there are so many great lifestyle blogs to choose from! I would def look at I Pick Up Pennies, Abby is one of my favorite bloggers who documents these types of things and has a lifestyle blog! I love the worksheets you have put together. Great job on the blogging goals. Keep up the great work and live unstopppabel! Great, in depth post! I loved it and am looking forward to the blog planning worksheets (going to bed so will check them out in the morning). I just started a new blog to chronicle my journey towards financial freedom and debt reduction and I know this will help! Yeah Malea! What’s your blog page? Hey Kristin, I wanted to re-vamp my Boardbooster schedule and used your Pinterest Scheduler worksheet to help me. Thanks for sharing it and this worksheet! Thanks for the tips. I just started a blog and have a long way to go…LOL. 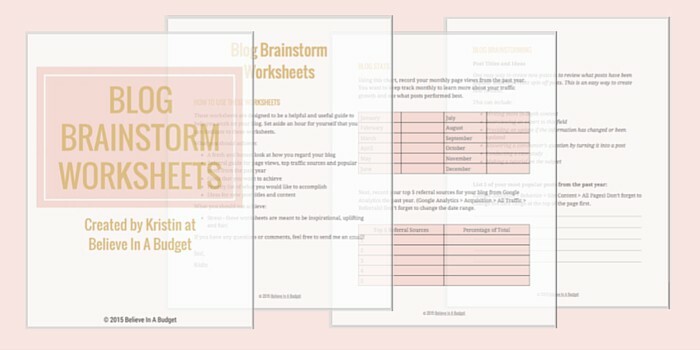 I’m looking forward to receiving my brainstorm worksheets. Thank you! Congrats Crystal, that’s so exciting! Let me know if you need help with anything!! Brainstorming regularly is so important! I try to do this at least once a month and try to come up with as many blog topics as I can. It is so helpful! I would be so lost without brainstorming! What a great post! I too try to brainstorm once or twice a month. I find that by keeping a running list of things to write about I rarely get writers block. You mentioned using fiver as a way to find someone to help speed up your website. Do you have any suggestions on a good person to work with? Mine seems to be having speed problems right now. I use Pixabay for my free photo site and love it. I’m going to have to check them out. You mentioned building a photo library. Do you just save them on your computer or have somewhere else that you prefer? Love this post! And the worksheets seem very helpful. I don’t brainstorm as much as I should. I think of post ideas at random times so I’m getting more into the habit of jotting ideas down in my planner as I get them. I keep a journal with me for the same reason – you never know when you’ll have a great idea! I am so inspired by what you have done with your blog! I have never utilized Google Apps, so thanks for the tip and I’ll let you know how it goes. Keep up the good work! Thanks Petrish! I had to really explore what all Google Apps had to offer and it’s definitely made things easier having all my emails, files and photos in 1 spot.